If you somehow foresaw what the Oakland Athletics would wind up accomplishing this year, you must be one hell of a genius, and probably the type of person that possesses Rainman type of skills. That is just how out of the blue the A’s ascension from cellar dwellers in 2017 to a 97-win season and appearance in the Wild Card game was. In examining this team’s success, it’s easy to do some headscratching. After all, Oakland was middling defensively and finished 20th overall in team ERA. So besides some solid offense that finished fifth in team OPS (spearheaded by Matt Chapman‘s 100 runs, Khris Davis‘ 48 homers and 123 RBI, Jed Lowrie just missing 100 RBI, Stephen Piscotty‘s ISO breakout, Marcus Semien just missing his first 90-run season, and a full season from Matt Olson), just how did the A’s flirt with 100 wins? Lefty specialist Ryan Buchter showed the best control of his career. One hurler that had a somewhat important role early on but wasn’t around for the real fun is Santiago Casilla. The veteran Dominican reliever seems like he’s been around forever. A long-time Bay area staple, he was first pitching for the A’s when across the Bay Barry Bonds was still dominating the game. Casilla had some cups of coffee for Oakland for three straight years, finally establishing himself as more or less a full-time big leaguer in 2007, which ironically, was Bonds’ swan song season. 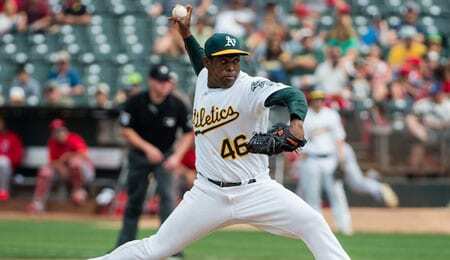 The A’s released Casilla after the 2009 season, but the Giants pounced, and he quickly settled in as one of the more dominant relievers in team history. San Francisco’s bullpen was dynamite around this time, but it was Casilla that mostly closed for the team over a superb five year stretch. In fact, he ranks seventh all time in WAR among Giants relievers in the club’s history. Only Robb Nen had a better ERA+. Yet Casilla was among the most derided players on the Giants in that era. We’re not sure how much more the dude could have done for the team. For his first six years in San Francisco, check out his ERA by season, starting in 2010: 1.95; 1.74; 2.84; 2.16; 1.70; and 2.79. Wow, that kind of dependability and consistency from a reliever is Fantasy gold. And for all the talk about his playoff meltdowns, Casilla has been ever better on the big stage. In four playoff runs, he’s never had an ERA higher than 1.93 and, for his career, his mark is 0.92 for 25 games and 19 2/3 innings pitched. Is someone seriously going to slag him for that? In short, Casilla put up some crazy good numbers for the Giants before returning to the A’s as a free agent in 2017. Although he wasn’t as sharp last year, he again found himself mostly closing for Oakland. This year, Casilla was more unhittable than ever (career low .170 BAA), but his command was shoddy and he also missed around two weeks with a shoulder woe. The A’s opted to DFA him in mid-July and not long after, Colorado signed him to a minor league deal. Unfortunately, Casilla was absolutely shelled at Triple-A and never got the call back to the bigs (although in the video below, you can get a sense of what he would have looked like pitching for the Rox). Now 35, he’ll be a free agent this winter, and we could see another western team in need of bullpen help taking a chance on him rebounding (the Angels are rumoured to be interested). We truly hope this isn’t the end of the line for Casilla, but if it is, it’s been a nice run with 655 appearances over 15 seasons, all with the A’s or Giants (unless you count his adventure for the Rockies’ Triple-A team over the last few weeks of this season). To get a sense of how he stacks up historically, let’s look at the three pitchers that he’s ranked most similarly to, as per Baseball Reference: Jonathan Broxton, Heath Bell and Keith Foulke. Needless to say, that’s some pretty good company for Casilla. If you are interested in sports betting and you are not sure of what the laws are in your state check out the BettingTop10.com State by State guide to America’s gambling laws. Here’s another track by Boney M, the brainchild of German producer Frank Farian, who you might also know as the voice behind lip-synching wonders Milli Vanilli. In 1976, Boney M released Take the Heat Off Me, featuring this track, “Still I’m Sad,” a cover of a tune by The Yardbirds. Now it’s your turn. Let us know in the comments below where you think Santiago Casilla will wind up and how you think he’ll fare in 2019. This entry was posted on Tuesday, October 16th, 2018 at 3:59 pm	and is filed under BASEBALL, Player profile, RotoRob. You can follow any responses to this entry through the RSS 2.0 feed. Both comments and pings are currently closed.